This morning we awoke to a windy start. We were riding at around 9am. The wind was a cross/head wind. So at times it was slow going. But at least the road was good. At about 40km we stopped at a creek for lunch and tried to eat without the flies annoying us too much. The next 20km went pretty quick as the road had turned a little so it was more of a slight tailwind. The final few kms down to Algebuckina the road surface changed frequently, from good dirt, to soft sand and some gravel sections. We arrived at Algebuckina Bridge just after 3.30pm we decided that we'd have a look at the bridge tomorrow morning. We rode on for another km to our camp site, Algebuckina waterhole. Again the road was a little sandy in places and we had to walk our bikes through. But it was worth it. When we got to the water hole we saw this huge expanse of water. We found a camp spot on the bank and once setup decided to go for a quick swim. Brghh, the water was cool but really nice and refreshing. It was interesting getting out as the banks up are pretty steep. A nice end to, at times, a hard day in the saddle. Later on in the evening we had another campfire and again spent a bit of time chatting around it, before going to bed. Tomorrow we are heading for the big town(!) of Oodnadatta. A short ride day so will have plenty of time to check out the bridge on the way out of the campsite. This morning I had to have another swim before left this morning. Such a wonderful waterhole to camp next to. A little interesting getting out though, as the sides of the banks were very steep and muddy. After we left our idyllic camp spot we stopped at Algebuckina Bridge. The bridge is the longest one in South Australia and was built to carry the Ghan. It certainly felt very big when up at the top looking across its span. When we finished at the bridge we headed to our next destination, Oodnadatta. The wind had dropped a lot compared to yesterday, there was still a slight cross breeze today. The first 20kms or so there was a mixture of road surfaces along the way. We then began climbing through a small range of hills. Both myself and Jim were feeling a little tired as we had not had a rest day from out bikes for at least a week (12 days for myself). The views from the top of the climb were pretty good though. After our hill climb for the day it was mostly downhill into Oodnadatta and the roads were less sandy. It was quite warm though as there was little cloud cover today. So I took a couple of extra breaks along the way under shady trees to cool down. We got to Oodnadatta at about 3pm. 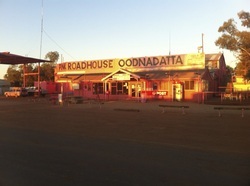 Oodnadatta is a small town of about 200 people. There is the famous Pink Roadhouse, a pub, general store and musuem. We decided to stay in the budget accommodation for a couple of nights. I collected my parcel of goodies from the post office, which I had sent from Sydney before starting this trip. Later we enjoyed a meal at the roadhouse. Whilst ordering we met a guy from South Africa who is flying around the world in a single engine plane for 10 months. Sounded like a real adventure, tomorrow he was flying to Uluru. I'll be there in 2 weeks! Tomorrow I'm going to the museum,catching up on sending a few things home I don't need and generally relaxing. Then on Thursday I'll be continuing my ride along the Oodnadatta Track. Had a good sleep but was still up early making breakfast and repacking the bike. I've arranged for some things I don't need anymore to be sent home. Also I've refilled my water bladders for the next 3 days until Marla. A little later in the day Jim and I had a walk to the museum. Found out when we got to the museum we needed a key and had to go back to the roadhouse. Once we had the key we found the museum gave a really good insight into the town of Oodnadatta. It was interesting looking at pictures taken in 1900 and then almost a hundred years later, the town looked almost the same! After we headed back to the roadhouse. Jim was told he had to vacate his room as it was booked tonight. There is a spare bed in my room but we agreed it was a very small area. So he took a larger room. Certainly more fancy than mine. He has on the latest mod-cons. Like a working TV, fridge and double bed to spread-out on! He was very kind in inviting me other for lunch and we agreed to cook dinner together tonight. Tomorrow we are back on our bikes to complete the Oodnadatta track. I was able to check the weather via the internet (at the community centre) and looks like it'll be a little warm for the next few days but dry. Should be on the Stuart Highway by Sunday.